The majority of Hongkongers celebrate Christmas on December 25. However, a handful will set aside January 7 as their holy day – that’s the day the Russian Orthodox Church observes Christmas Day and many non-Russian Hongkongers have embraced the faith. Christmas for Orthodox churches refers to the same holiday as the Catholic Christmas, but is based on the Julian calendar, introduced by Julius Caesar in 45BC, instead of the Gregorian calendar. During Soviet times, religion was banned by the communist regime, so New Year festivities replaced Christmas celebrations. In Hong Kong, the Orthodox Church hosts a Christmas service and New Year party. Father Denis Pozdnyaev, of Saints Peter and Paul Orthodox Church, says his Easter service is more popular than the Christmas one and, theologically, Easter carries more weight. “Jesus Christ was born to sacrifice himself for mankind. So his resurrection is an ultimate proof of Jesus’ mission being accomplished,” he says. The Russian Orthodox Church in Hong Kong has been steadily growing in recent years, with 25 per cent of its members being non-Russians and admits it focuses more on its Chinese followers. Father Denis says there is a common ground between the Orthodox religion and Chinese culture, especially in moral and ethical values. They translate the Bible and books about the Orthodox religion and do their services in multiple languages, including Russian, English and Chinese. The number of Orthodox Christians in China is estimated to be about 15,000. Ambrose Lam, a Chinese Orthodox Christian who came from the mainland, says the early stage of his spiritual journey was not easy. “Not many people understand the Orthodox religion, so my parents and friends were concerned at the beginning,” he says. Father Denis says a key misconception of the Orthodox religion was that it is a religion of Russia and for Russians only. In fact, he says, the Orthodox religion is culturally adaptable and its set of values is universal. Still, the development of the Orthodox religion in Hong Kong is closely linked to the history of Russian immigration. 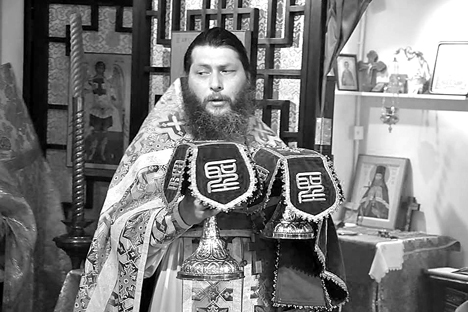 “One of the White Russian emigrants in Hong Kong was the first Russian Orthodox priest, named Dimitry Uspensky,” Pozdnyaeva Kira, also of Saints Peter and Paul Orthodox Church, says. “After 1917, he was sent to China and, in 1934, he was appointed as chief priest of the Hong Kong Russian Orthodox community that comprised about 300 to 400 people. The life of Father Dimitry, who passed away in 1970, typifies the history of Russian immigration history to Hong Kong. There are 105 Russian Orthodox graves inside the Hong Kong Cemetery, and each of them has its own story to tell. Historian Jason Wordie says: “The first wave of Russian emigration to Hong Kong could be traced to the 1920s, followed by the second wave in the 1940s. Driven by the October revolution in 1917, some of these emigrants sought refugee status and paved their way to the United States and Australia. Asked about what impact the Orthodox Church aspires to create for Hong Kong communities, Father Denis says: “I think the Orthodox Church shall bring to the people of Hong Kong an understanding of the ways of Christian spiritual practice.